Superior tells the disturbing story of the persistent thread of belief in biological racial differences in the world of science. After the horrors of the Nazi regime in World War II, the mainstream scientific world turned its back on eugenics and the study of racial difference. But a worldwide network of intellectual racists and segregationists quietly founded journals and funded research, providing the kind of shoddy studies that were ultimately cited in Richard Herrnstein and Charles Murray’s 1994 title The Bell Curve, which purported to show differences in intelligence among races. If the vast majority of scientists and scholars disavowed these ideas and considered race a social construct, it was an idea that still managed to somehow survive in the way scientists thought about human variation and genetics. Dissecting the statements and work of contemporary scientists studying human biodiversity, most of whom claim to be just following the data, Angela Saini shows us how, again and again, even mainstream scientists cling to the idea that race is biologically real. As our understanding of complex traits like intelligence, and the effects of environmental and cultural influences on human beings, from the molecular level on up, grows, the hope of finding simple genetic differences between “races”—to explain differing rates of disease, to explain poverty or test scores, or to justify cultural assumptions—stubbornly persists. 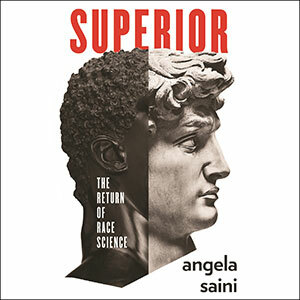 At a time when racialized nationalisms are a resurgent threat throughout the world, Superior is a rigorous, much-needed examination of the insidious and destructive nature of race science—and a powerful reminder that, biologically, we are all far more alike than different.